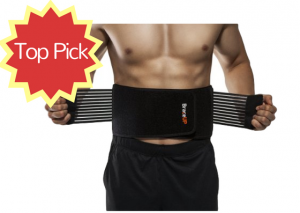 Here’s a rundown of our favorites, including our top pick – BraceUP Stabilizing Lumbar Lower Back Brace and Support Belt. Spinal disc herniation or “slipped disc” occurs when one of the soft cushions between your spinal bones or vertebrae pushes out. While usually not life-threatening, a herniated disc can lead to chronic lower back pain, sciatica, and leg pain. Many health professionals recommend the use of a back brace to help relieve discomfort by limiting the motion of the spine. To see which braces stand up to the challenge, our team tested a wide range of brands and styles. We found the following back braces to be the best. Targeted Relief: There are numerous types of back braces on the market. Be sure that the one you choose is designed for mid-to-lower back pain. Firm Support: Firm back support is needed to stabilize the spine and reduce pressure on your discs. Soft Material: If you have a herniated disc, you’ll likely be wearing your back brace for hours each day. Choose a brace made from a non-irritating material. Proper Fit: One of the most important aspects of a back brace is fit. The brace should fit snug around your torso and should not slide or roll up. Going through the discomfort of a herniated disc on a day-to-day basis is hard enough without having a brace that decreases mobility. 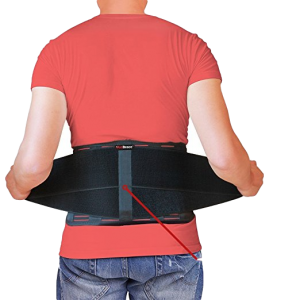 What we loved about the BraceUP Stabilizing Lumbar Lower Back Brace with Support Belt is that it gives adequate support to your back while still allowing you to maintain a full range of motion. The unique brace features a curved design that helps eliminate uncomfortable bunching and slipping. You will also find dual adjustment straps that provide users with a comfy, customized fit. Available in a selection of sizes, the BraceUP back brace offers a variety of great features that make it our number one choice for the best back brace for herniated discs. The strong yet flexible material provides just the right amount of lumbar support to relieve excess strain on the discs while helping to maintain proper spine alignment. The brace also has convenient mesh panels that work well to release excess heat and moisture throughout the day. A back brace is an effective, non-surgical way to help support the back as you recover from a herniated disc. Best of all, back braces are very affordable and do not require a prescription. However, not any back brace will do. Choose a high-quality option like the Lumbar Lower Back Brace and Support Belt by Cotill. What makes this back brace stand out amongst the sea of braces is its eight stable bars, dual adjustment straps, and fully adjustable, breathable elastic side panels. The brace also features therapeutic fat burning heat that provides muscular warmth. Not only is this back brace the perfect option for individuals suffering from a herniated disc and other lower back conditions, it also works to improve posture and protect against future injuries. Choose from a range of sizes to ensure the perfect fit. Cotill also stands behind their product. If you are not satisfied with the quality of the brace for any reason, the company offers a 100% money back guarantee. Keeping active is important even after suffering from a herniated disc. However, you shouldn’t do it without proper protection. The Mueller Adjustable Back Brace with Removable Pad offers adequate relief from herniated discs, muscle spasms, strains, sprains, and other injuries while helping you maintain mobility. Constructed of polyester, rubber, and nylon, the versatile back brace offers just the perfect balance of flexibility and rigidness. The brace features removable lumbar pad cushions to help compress the lower back and support the spine. You’ll also find flexible steel supports along the spine and molded plastic internally to eliminate bunching. It can take months to recover from a herniated disc and some in cases, the symptoms are ongoing. Fortunately, a well-made back brace like the ComfyMed Premium Quality Back Brace can help reduce symptoms during recovery and long after. Considered one of the most comfortable back support belts on the market, we found this premium product to fit comfortably and provide nearly instant relief from pain. It’s also the only back brace that has easy grip handles. If you’re in search of a natural treatment for back pain, this is it. 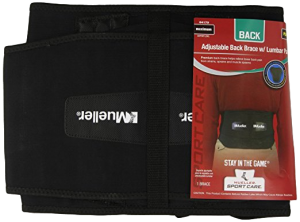 Available in unisex sizes measuring 26 inches to 50 inches, the versatile brace offers all of the features we look for in a back brace. In addition to a removable lumbar pad, the brace is lightweight, durable, washable, and made with high-quality materials. It also offers therapeutic warmth to keep your muscles warm for faster recovery and enhanced pain relief. Due to the unique design, the brace stays in place all day. Our final choice for best back brace for a herniated disc is the AidBrace Back Brace Support Belt. This upgraded and improved version is made with industrial durability and premium materials for many years of support. The brace features a unique removable cushioned lumbar pad for enhanced support as well as a curved side design that provides adequate comfort while putting less pressure on the abdomen. The flexible design of the back brace allows for full mobility so you don’t need to stop your daily activities. We also liked that the back brace works well to correct poor posture which is important when recovery from an injury. The back brace is also easy to maintain. Simply wash it with water and a mild detergent to keep it strong, odor-free, and working at an optimal level.